Don't miss this Google Analytics Workshop at #RocksDigital 2017. 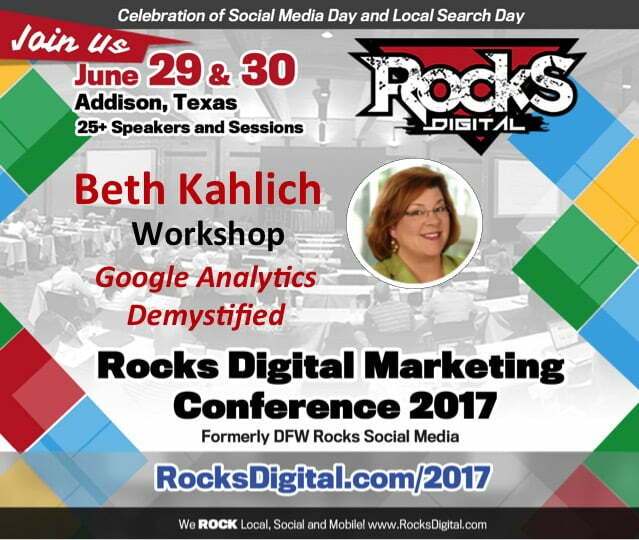 It will be led by Beth Kahlich who is a nationally recognized SEO Trainer. 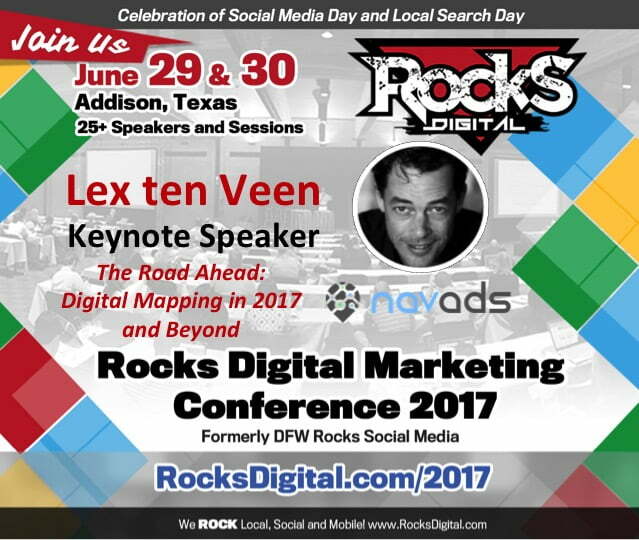 Lex ten Veen of Navads to keynote on why digital maps are a pivotal component of today’s marketing mix for local businesses at #RocksDigital 2017! Location-based mobile marketing expert, Danielle Hanson, of Thinknear will join the Local Search Expert Panel at Rocks Digital 2017. Don't miss it! CEO of Surefire Local, Chris Marentis, joins the Local Search Expert Panel at Rocks Digital 2017. You don't want to miss this! Join us as we welcome Hillit Meidar-Alfi, CEO and Founder of Spatially, on the Local Search Panel at Rocks Digital 2017! Register now! Don't miss the Queen of Local SEO, Bernadette Coleman, as she moderates a panel of local search experts at Rocks Digital 2017! To stay in the game of search, you have to constantly adapt and right now, that means understanding the "near me evolution"! Join us for this Rocks Talk and explore this important topic! Greg Sterling VP at Local Search Association joins the 2017 Rocks Digital Marketing Conference speaker lineup. Come explore the future of local search with us. Bill Hartzer, Digital Marketing Expert to speak on everything you need to know about On-Page and Off-Page SEO at Rocks Digital 2017. Moosa Hemani to share his expertise on conversion-centric link building techniques at Rocks Digital 2017. DeAndre Upshaw has worked with more than 600 brands on visual storytelling and is coming to share his expertise with you at Rocks Digital 2017. Don't miss it! Learn about the "Evolution of SEO" at Rocks Digital 2017 from digital marketing expert Lance Bachmann.